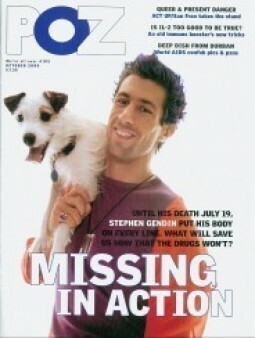 Today marks 16 years since Stephen Gendin passed away. 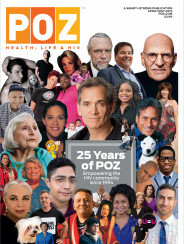 He was instrumental in the creation and direction of POZ Magazine, an incredible asset to the AIDS community and a tireless activist. But to me, he was the coolest guy in the POZ office (always a tough crown to achieve)—with his dyed hair, accompanied by his dog, Zoom, whose tail color matched Stephen’s mane. Stephen’s support of my writing—and my own humorous take on activism—meant so much in those early days of wearing my HIV status on my sleeve. When I started doing the Labtest Contest in 1997, he loved the idea. He even won once, taking home the grand prize of an autographed photo of me and Danny Bonaduce. (Autographed by me.) Stephen was also the first person to really bend my ear on the need to consider HIV meds—back then I was not ready... he recognized that, but let me know how he felt about my decision, too. I hop you’ll help me get Stephen’s fund over the hump, in the same way his words helped me get over mine.